Thirty corporations spent $476 million to lobby Congress over three recent years. Their investment paid off: They dodged $68 billion in federal taxes. Corporations have learned that they can write the rules in their favor by keeping lobbyists on Capitol Hill, and by contributing to the campaigns of politicians. Their lobbying has helped to keep tax loopholes open, pass special corporate tax breaks and discourage Congress from passing real tax reform that asks them to pay their fair share. It’s not always easy to tell the corporate lobbyists from other advocacy organizations. Huge corporations have formed coalitions and front groups like Fix the Debt, Alliance for Competitive Taxation, the LIFT Coalition, and the RATE Coalition to make it seem like the movement for lower corporate taxes is a grassroots one. But these groups are all funded by corporations that stand to benefit the most from the tax breaks that they advocate for. We need a tax code that requires everyone to play by the same rules. As long as corporations keep politicians in their pockets without any real opposition, tax reform that works for the rest of us will just be a dream. Get involved, and let’s build a real grassroots movement that is strong enough to counter-balance their millions of lobbying dollars. 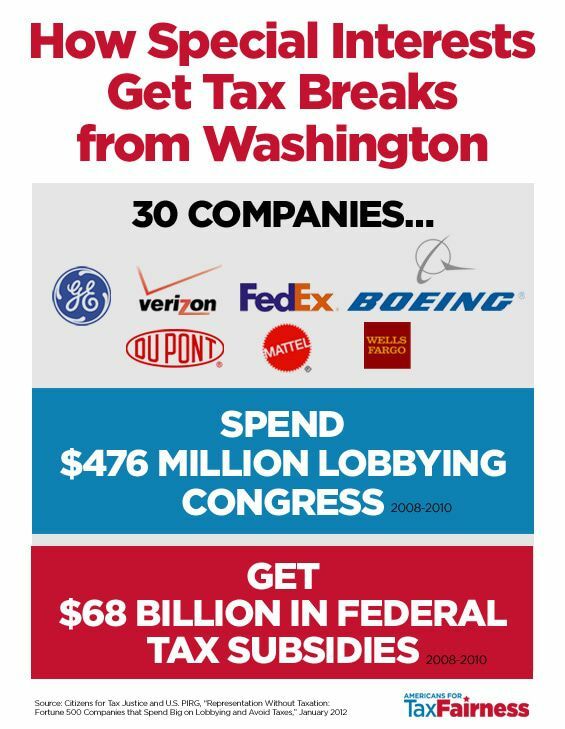 This report takes a hard look at the lobbying activities of profitable Fortune 500 companies that exploit loopholes and distort the tax code to avoid billions of dollars in taxes. This report pursues the intersection of corporate campaign contributions to members of Congress and the absence of Congressional action to close corporate tax loopholes and raise additional revenue from corporate taxes. Although the U.S. economy is still recovering from the economic collapse of 2008, corporations are recording record profits.